If any Cobra qualifies as a sleeper, its Als, with the lone variations being a Cobra R hood and American Racing Le Mans wheels. Even with the cars sleeper status, Al will make known its real power on the unsuspecting at a moments notice. Al reports the engine has been a rock ever since hes had the car running. The only real problem with squeezing in the 5.4, which is 2.5 inches wider than a 4.6, is that the valve covers cant be removed with the engine in the car, he says. His goal with the intake was to make it look factory, which it indeed does. Al also had to modify the factory Cobra fuel rails by cutting off the stock brackets and making new ones in order for them to work. Horse Sense: Before getting into drag bikes, Al Papitto was an SCCA Rookie of the Year in 1978, a Regional Champion in 1979, and he finished Second in points in the South Atlantic Championship series that same year. To get started, Al attended two race schools behind the wheel of an MG Midget. When he entered the SCCA competitive ranks, it was at the helm of a B/Sedan Toyota Corolla, which is the equivalent of a current GT3 car. If you've followed the Pro Stock bike ranks in the last couple years, then you know the big names-Dave Schultz, Steve Johnson, John Myers, Angelle Savoie, Matt Hines, and Antron Brown, to list just a few. One racer you may not have heard of-but not for his lack of trying-is Al Papitto of Vero Beach, Florida. Al raced side by side with the top names in Pro Stock bike, but without the financial backing enjoyed by those listed above, he wasn't able to regain the success that rewarded him with back-to-back International Drag Bike Association championships in 1996 and 1997. Frustrated with mounting rules and sanctions (we thought that only happened in Mustang drag racing), Al lost the desire to race competitively by March of last year. Prior to hanging up his leathers, he ran a best of 7.26 at 188 mph in the quarter. He just didn't believe Pro Stock bike was the right direction to go in anymore. 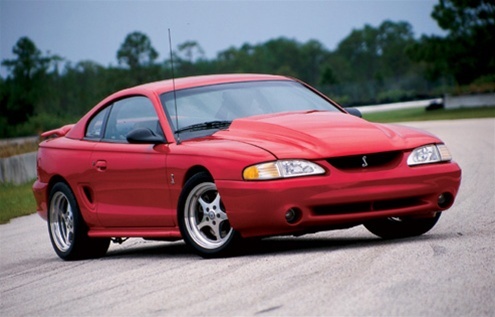 These days, Al's '97 Cobra is always pointed in the right direction, and it doesn't take long to get where he's going with a Navigator Four-Valve 5.4 under the hood. "The whole thing started when my wife found this car sitting on a used-car lot, abandoned like a rabid dog," Al says. "One hour later I drove it home and began to clean it up." One of his friends had been racing a nitrous'd Cobra and wanted Al to build an engine for the car. "I was drawn to the Cobra because of the technology," Al says. "The Four-Valve, in many ways, resembles a motorcycle engine. If the cars still had 302s in them, I probably wouldn't be into Mustangs." After retiring from racing bikes and becoming bored with the Cobra, Al decided it was time to spice up things. After constant prodding from his wife, he started working with Paul Stefansky on his 5.4 Navigator engine. Seeing what was available for the modular motors, Al knew just what to do. Once he had his own 5.4, he decided the widely held belief that there were no modular parts out there was untrue. Al began cooking up a combination. He started by having the block bored 0.020 over and filling it with the stock forged crank, Manley billet rods, and custom JE pistons. American Cylinder Head handled the machine work, while Al sourced Pro Power for the rods and pistons. With the bottom end transformed, Al set his sights on the Four-Valve heads-the most modified part of the engine. His motorcycle background made the modifications come easy. "The Four-Valve's tumble-port design looks a lot like a Suzuki Hayabusa head," he says. Cope Racing Engines' (which built and prepared the engines for the late Dave Schultz's three-time championship Suzuki and Al's two-time championship Suzuki) Buddy Ordway spent many hours on the valve seats and ports, while Al was busy making the valves from Ferrea blanks initially designed for Kawasaki engines. Kawasaki Z1 valvesprings and titanium retainers, along with Crane Cams' reground cams, complete the valvetrain. Though the heads were easy, the difficult part came in the intake department. After much research, Al decided to make his own lower intake, which took him a month and a $3,000 investment. A Hamilton Clarke intake cover tops it off. With the potential power-making ability of the 5.4, Al knew the T45 wouldn't live long, so he contacted Don Walsh at D&D Performance for a TTC T56. D&D also set up Al with a custom driveshaft and a McLeod flywheel. The stock 8.8 was built to take the 5.4's power using a Detroit Locker C-Locker differential, Superior 31-spline axles, and 4.30 gears. If you think the gears are too steep, Al says that at 80 mph the tach reads a steady 2,400 rpm. Once the drivetrain was finished and installed in the car, Al drove it around for 400 miles with the stock fuel system, mass air meter, and injectors. Then it was off to Unlimited Performance to add a bit of performance pixie dust on the Dynojet. On the first pull, the 5.4 made 374 hp, which was a good starting point. To make sure the 5.4 wouldn't run out of fuel, UPR's Joe Mainiero then added a 255-lph in-tank fuel pump and 42-lb/hr injectors, along with a Pro-M 80mm mass air meter. With those additions and chip tuning, the numbers came up to 398 hp and 359 lb-ft of torque. Proving the heads flowed more than enough air, the horsepower was still climbing when the runs were stopped at 7,000 rpm. Since the first trip to the dyno, Al has added a Ford Racing Performance Parts single-blade throttle body. Obviously, Al knows his way down the 1,320. So far, he has run a best of 12.18 at 117 mph. That number was accomplished using the Nitto Extreme drag radials and coming out of the hole off idle. "At 7,300, it's still trying to rip off the tires," Al says. "If you stand on it in low gear, it wants to rip the rearend out of the car." Just make sure to keep it pointed in the right direction, Al.